This table runner is the perfect addition to your home decor. Table runners add a pop of color to the room, and look great in kitchens, dining rooms, living rooms, offices, bedrooms, etc. This would also make a great gift! 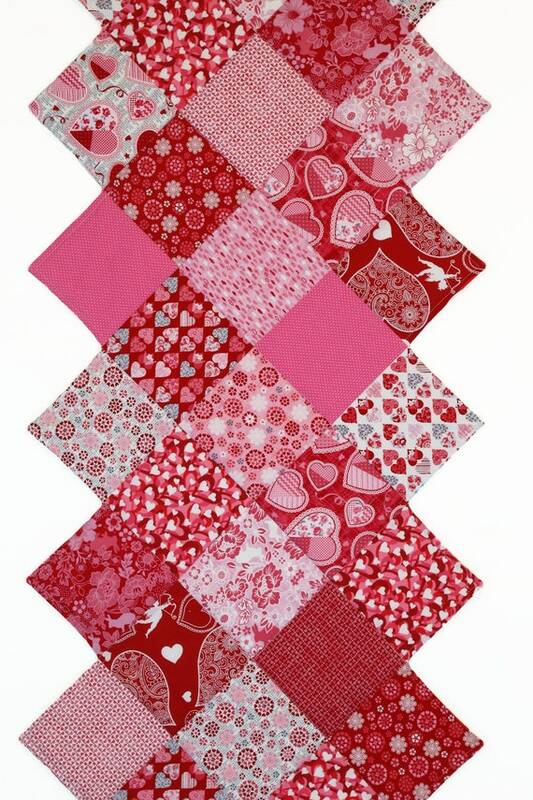 This table runner is made from many coordinating Valentine’s Day cotton fabric blockss. 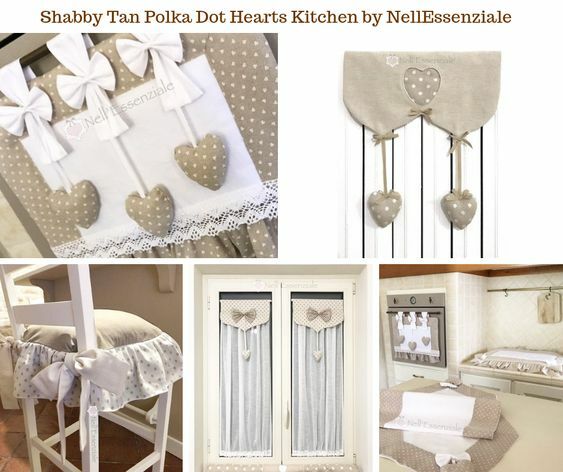 Fabric prints include hearts, cupids, polka dots, “love”, and flowers in pinks, reds, black, white, cream, and a pop of gold. 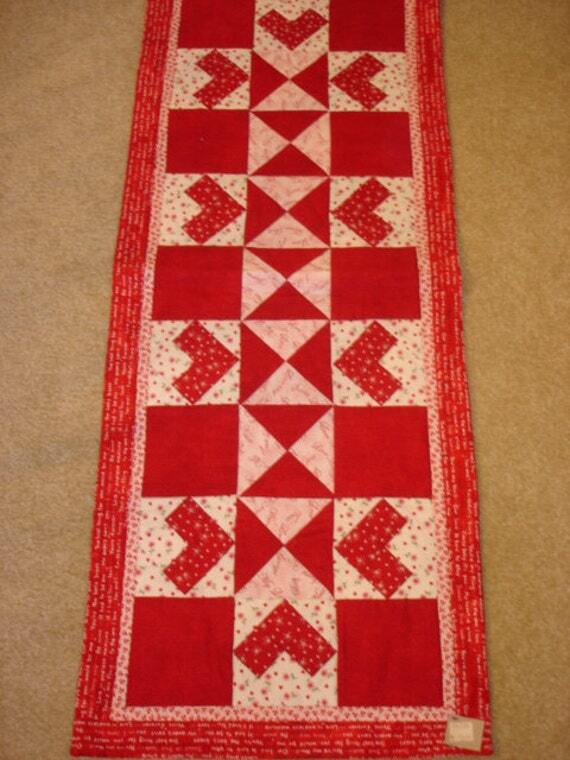 Blocks are sewn in a diamond patchwork pattern and the 2 ends meet at a point. The underside is a matching solid red fleece fabric. The runner is quilted following the seam lines where the fabrics are joined. You will receive the exact runner pictured (candles not included). • Care and Cleaning: Machine wash cold with like colors. Do not bleach. Tumble dry low heat. 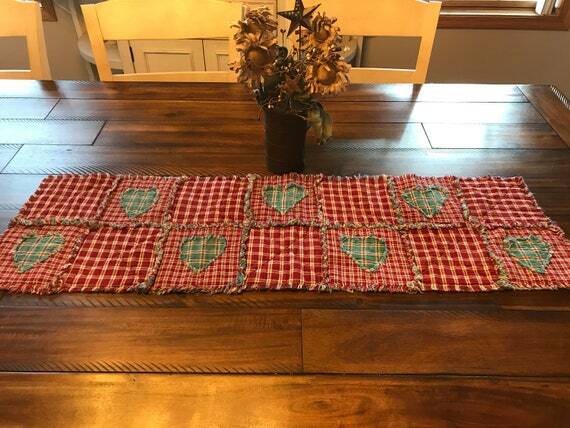 I made this table mat/runner with blue and red plaid homespun fabrics with hearts giving it a wonderful Prim Look. Could be used for many purposes. I used Warm and Natural batting for the center sandwiched between the fabrics. Each square is “X” quilted. I clipped edges and washed once to start the ragging effect. Would look great in any home! Flower arrangement not included. All of my table runners can be made into quilts. 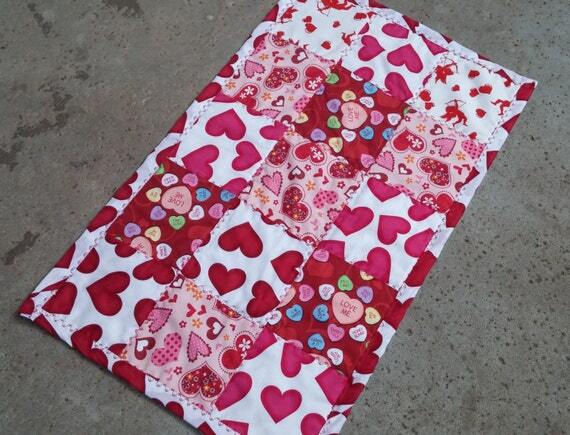 Handmade table runner for Valentines Day or home decor for the month of February. Made with 100% cotton fabric and long-arm quilted. Can washed with like colors. Our quilt-block-style birthday & holiday table runners will add so much fun to your celebration! Whimsical, silly creatures, colorful balloons and holiday-specific decorations – we can make them to order per your color specifications and/or table measurements, or you may purchase one that we have on hand ready-to-ship. From coffee tables to buffets, and sideboards to full-length formal dining tables, we have something suitable for everyone’s celebration setting! Great for use in the office, too! 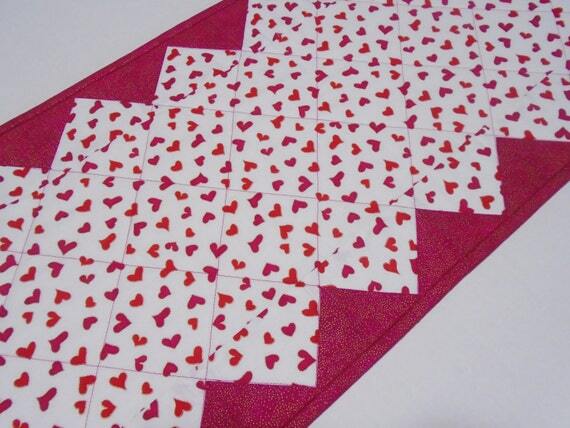 * This particular Love/Valentine’s Day-themed table runner is 69″ long x 19-1/2″ wide with plain white cotton fabric on the reverse side. Machine wash/line dry, touch-up with iron as needed. 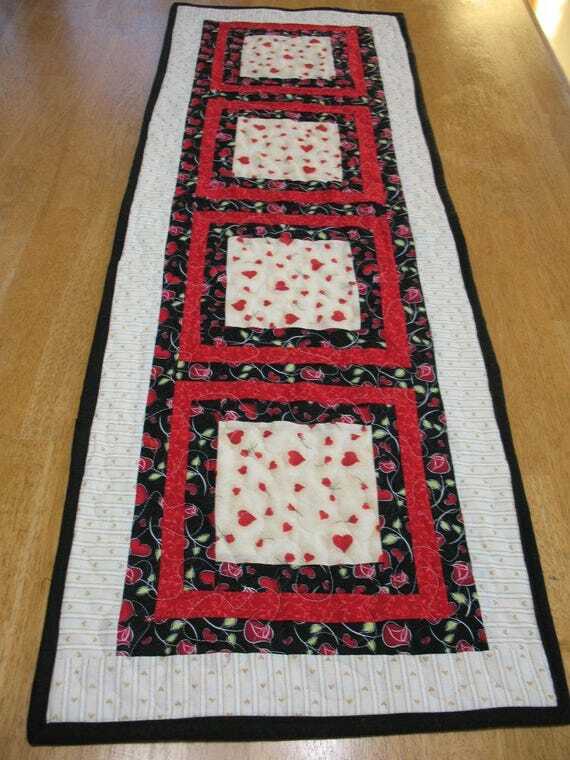 A beautiful Valentine Table Runner quilted and all ready to decorate your table or mantel top. It can be used across the bed or the back of your sofa. It would enhance any room in the house. It is made of 100 percent cotton fabric. The batting is Warm and Natural cotton. It has been quilted in an all over meander stitch on my professional quilting long arm machine. This will give you years of durabilty. It measures approximately 45 inches long x 15 inches wide. It is machine washable and dryable on a low heat setting. A warm iron for touch up and you are ready to use it again and again. 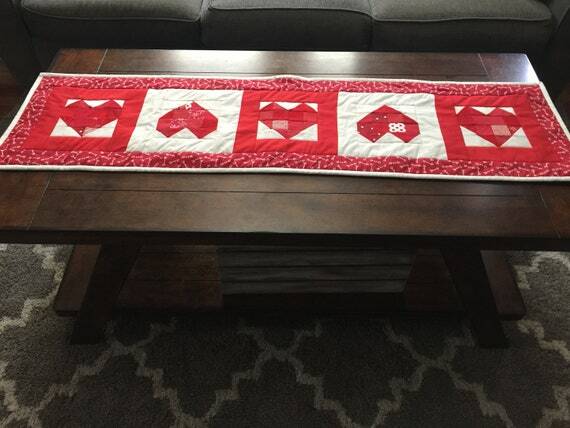 This Valentine’s Day quilted table runner is a great way to quickly decorate your home for Valentine’s Day. It would also be a great table decor for an engagement or wedding party. 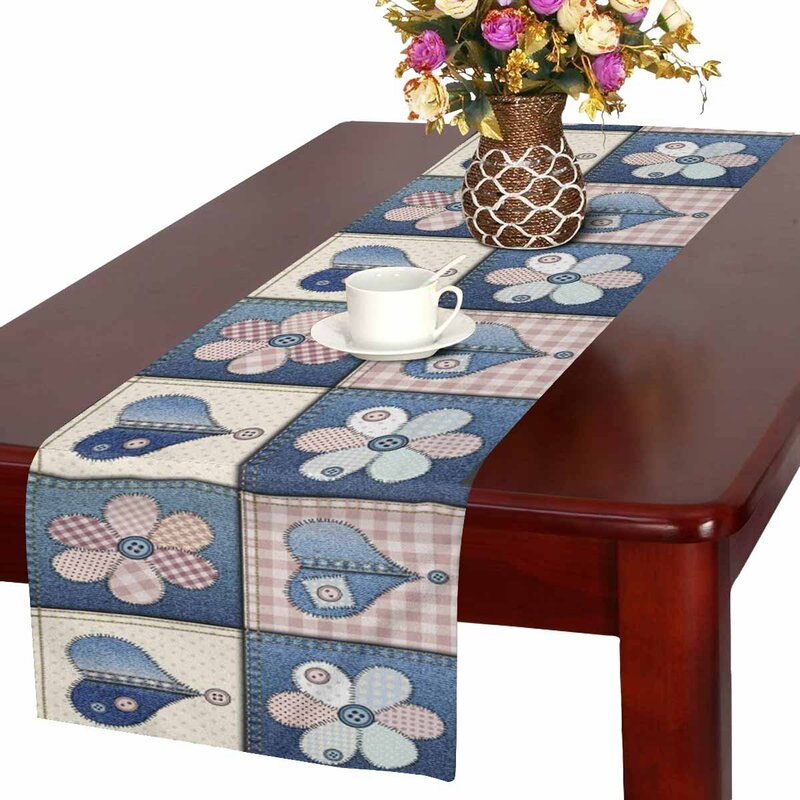 This table runner measures approximately 12 inches by 36 inches and is made with quality quilting cotton. The runner is machine quilted with light pink thread in straight lines length wise on the table runner. The black binding is doubled for extra durability. It is sewn on by machine on the front and hand sewn on the back. The backing is a complimentary pink. 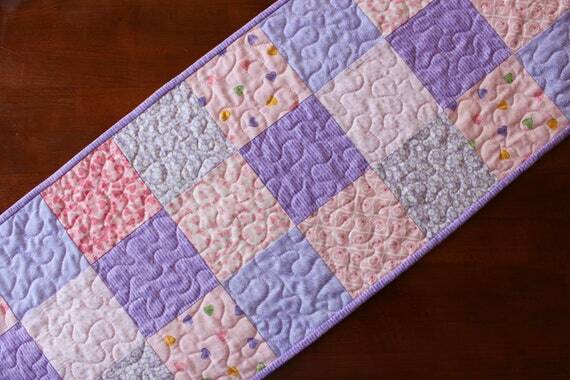 This hand crafted quilted mini quilt or candle mat is perfect for a small space that needs a little something more. These mini quilts bring such a comforting homey touch to any room. These are perfect for the back of your toilet. My grand daughters love these for Barbie quilts. This piece measures just over 18 x 9 inches and is made from 100% cotton fabric. The back is a black cotton print in coordinating colors. It has been machine quilted with 80 20 cotton batting and straight stitch on the diagonal for quilting, which adds some great dimension. 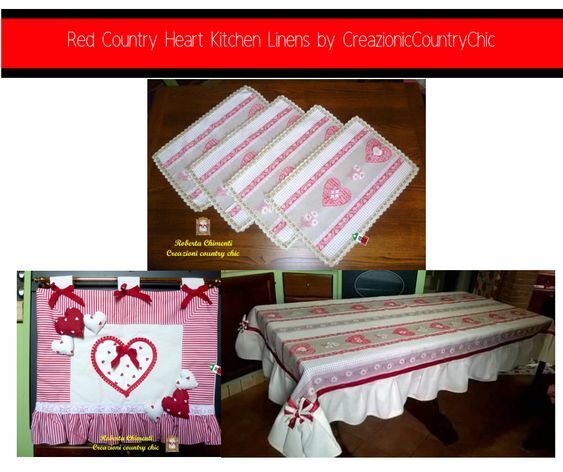 The patchwork hearts on this table runner are made of red with white hearts and white with red hearts in the same print. The backgrounds are a pretty red and aqua print on white and a pink and red dot on white. There is a white border and a red with white hearts border. 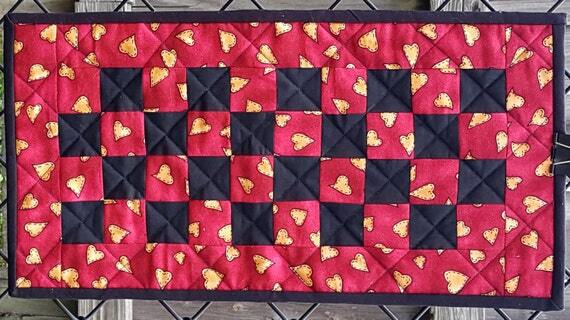 The quilting is done in all hearts. The runner is 19 x 51. The backing is a red with white heart print. Poly batting. Machine wash and dry. 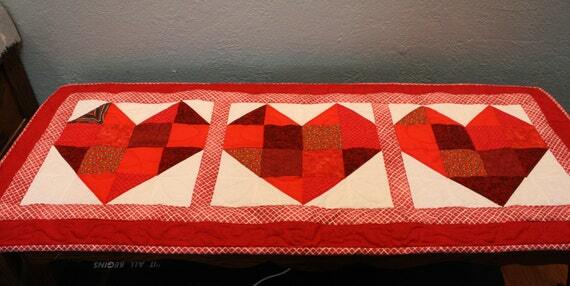 This stunning Valentine’s Day quilted table topper would brighten up any Valentine table decor. It would also be great to use for an engagement party as your table decor. The table topper measures approximately 14.5 inches x 14.5 inches. I purchase all of this fabric together so all the colors match. 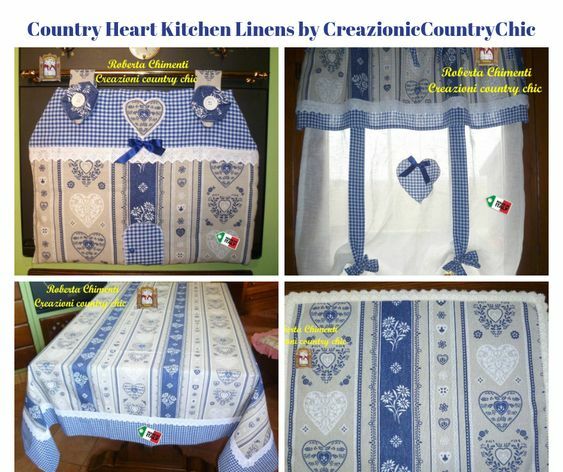 There is one fabric with hearts, one fabric has tic-tack dough with x’s and hearts and one fabric says made with love. The table topper is machine quilted with white thread following the design of the blocks. The white binding is double for extra durability. It is machine sewn on the front and hand stitched on the back. 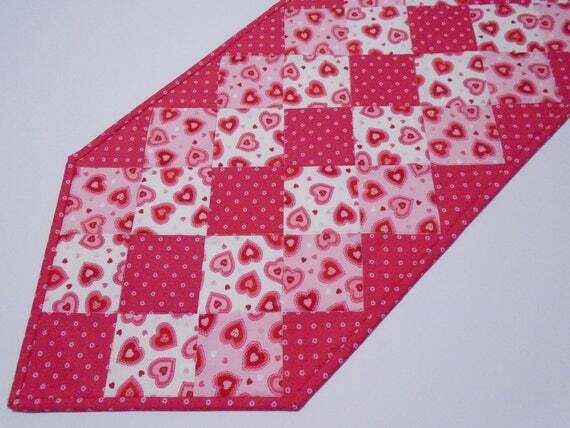 The front of the runner is made with blocks of red and pink hearts valentine fabric. The back is made with white on white hearts fabric. Machine quilted and 100% cotton. It measures 15″ by 36″. 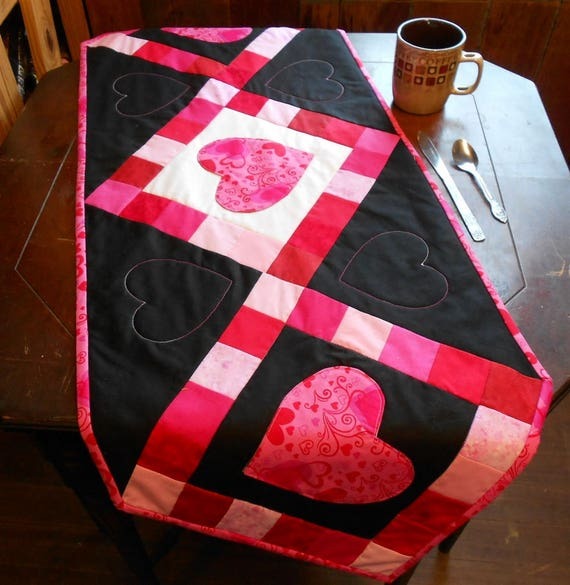 Enjoy this Valentine’s Day runner with hearts, flowers and paisley. The backing fabric is a cute little heart flower print. 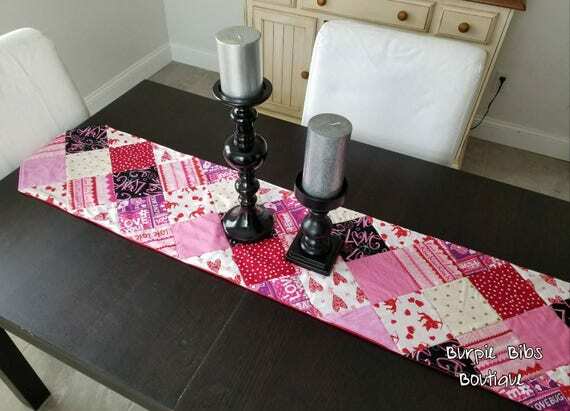 This Valentine quilted table runner features a collection of scattered hearts, flowers, and polka dots in pinks, fuchsia, and a touch of grey. The pink gingham double fold binding was machine sewn on, then hand-stitched to the backing, which is an ivory floral print. Machine quilted in a wavy stitch. Long table runner measures 14 1/2″ x 51 1/2″. Nicely sized for a dining room table, buffet table or countertop – to feature your Valentine treasures on. Machine wash gentle, warm. Tumble or air dry. Touch up with a dry, medium heat iron. 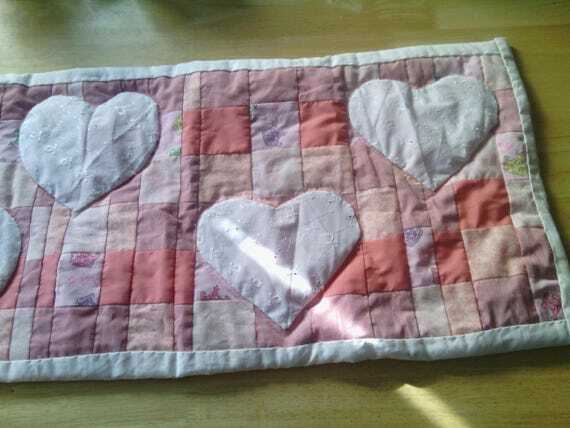 For your Valentines Day Decor, this Valentine quilted table runner features a scattered heart print in pink and white. 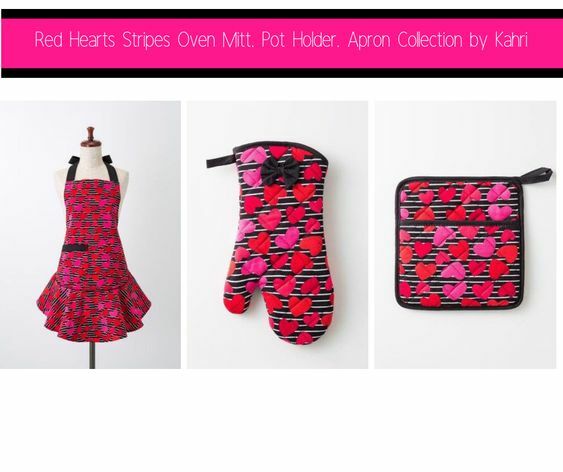 The larger hearts feature a button print. The center and setting triangles are bright pink with tiny white flowers. The double fold binding was machine sewn on, then hand-stitched to the backing, which is a white floral print. Machine quilted. Table runner measures 14″ x 47″. 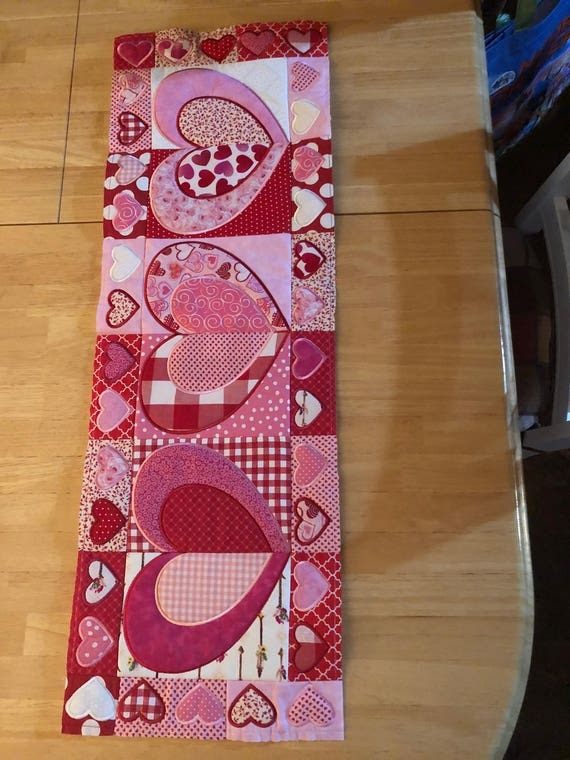 I have this adorable Valentine’s table runner for sale. It is 10 1/2” X 32”. Each fabric you see was appliqued on one piece at a time. This is a one of a kind. Each runner I make may have some of the same fabric but put together totally differently. I can also make two more sizes. Approximately 14” X 39” and 16” X 48”. 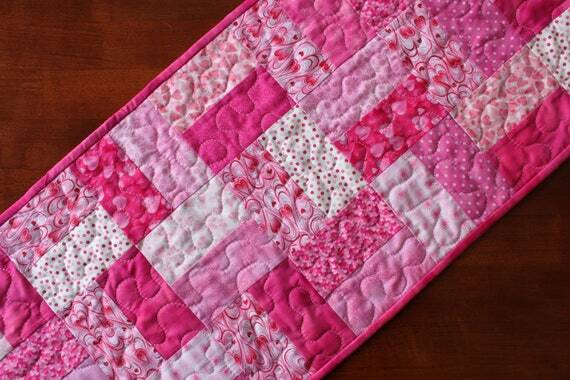 This fun quilted table runner was created with Valentine themed fabrics in pink, red and white. This table runner measures approximately 14” by 41” and is the perfect size to decorate your dining room table, coffee table, or any other surface that you want to add a splash of color to. The backing is a pink and white plaid fabric. This table runner was quilted on a sewing machine with light pink thread in a meandering pattern that complements the patterns in the fabric. It was completed with a double binding that is machine stitched to the front and then hand stitched to the back for durability. 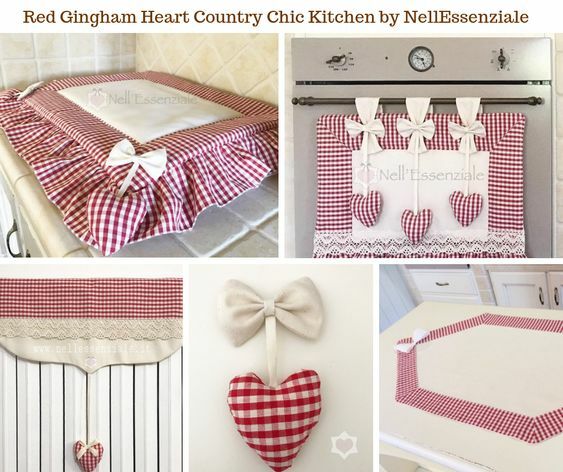 I made this table mat/runner with tan and Burgundy/tan plaid homespun fabrics with hearts giving it a wonderful Prim Look. It is also available in navy blue/tan plaid homespuns. Could be used for many purposes. I used Warm and Natural batting for the center sandwiched between the fabrics. 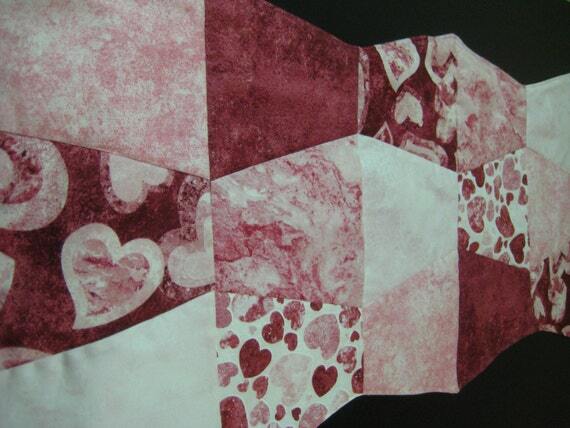 Each square that doesn’t have a heart is “X” quilted. I clipped edges and washed once to start the ragging effect. Would look great in any home! Flower arrangement not included. 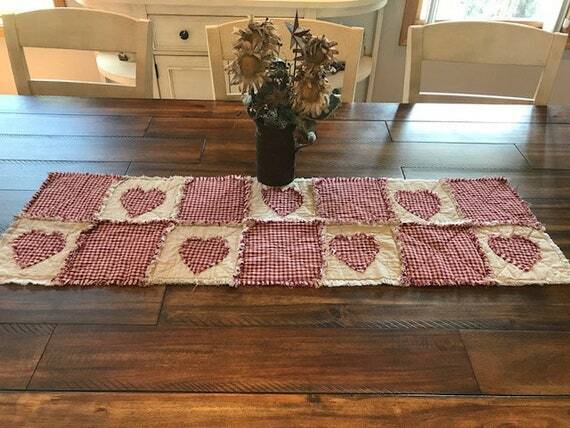 This Valentine quilted table runner measures a generous 51 inches long x 19 inches wide and has been created from a selection of pink and red 5 inch squares featuring pink hearts and fresh florals. 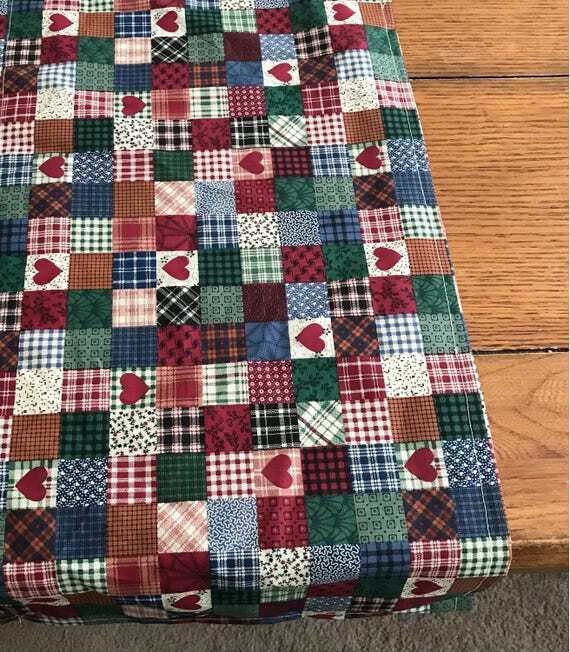 This patchwork table runner is in a unique zig zag pattern. The backing material of this table topper is in a coordinating fabric of spring green. 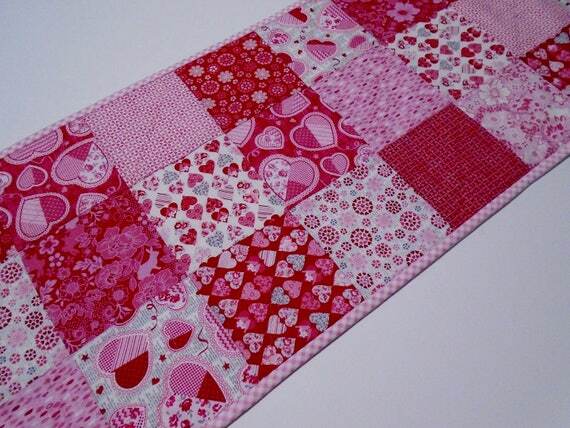 A table runner is sure to add a little pop of colour to celebrate your Valentine decor. 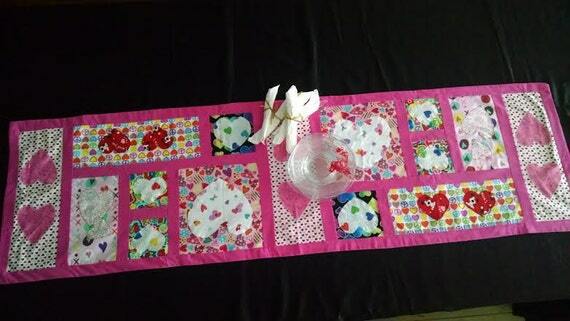 This fun quilted table runner was created with fabrics from Valentine themed fabrics featuring conversation hearts, flowers, hearts, stripes and various patterns in pink, purple, yellow, green and white. This table runner measures approximately 14” by 40.5” and is the perfect size to decorate your dining room table, coffee table, or any other surface that you want to add a splash of color to. The backing is a pink patterned fabric from Riley Blake. This table runner is made of 100% cotton fabrics, batting and threads in my smoke free, pet free sewing studio. It measures 40.5 x 17.5 inches. I have photographed it on our 6 foot farm table for size reference. 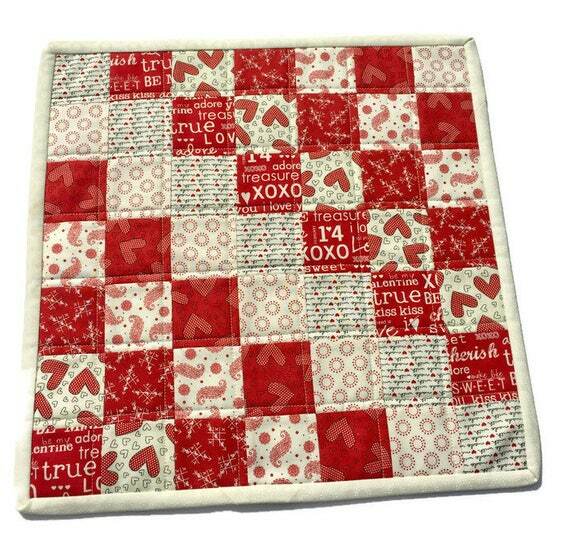 This table runner features 3 red hearts that is the perfect Valentine’s Day décor for your table. I have paired it with a single candle, but it would look so cute with flowers and other Valentine’s Day décor. It would look great on your table, or on your buffet. What a great way to great your guests! And what a great gift for yourself, mom, or special person in your life! 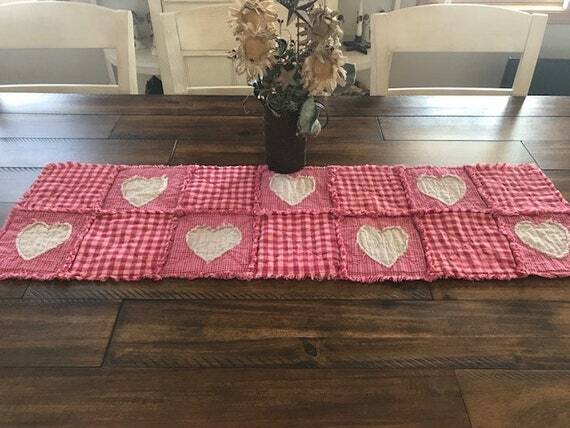 I made this table mat/runner with light and dark pink plaid homespun fabrics with hearts giving it a wonderful Prim Look. Could be used for many purposes. I used Warm and Natural batting for the center sandwiched between the fabrics. Each square is “X” quilted. I clipped edges and washed once to start the ragging effect. Would look great in any home! Flower arrangement not included. Hearts on top of other hearts. Big hearts little hearts cute, cute, cute. Made with red, black, and white fabrics that go together so well. Really pretty item. Made from 100% cotton fabrics and it measures 15″x45″. 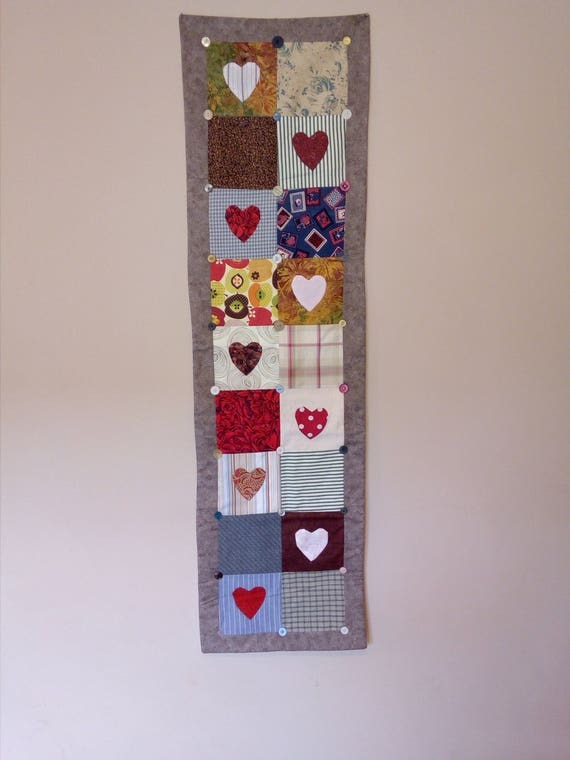 This adorable hand made table runner is prefect for your Valentine’s Day decorations! This piece is quilted with a beautiful and intricate pattern. Truly a one of a kind piece! Valentine Quilted hand made Table Runner, Reds, and white hearts I quilted hearts around the outside border in red thread. The binding is machine stitched to the front and then hand stitched to the back of this table runner. I made one of these table runners years ago for myself and always get comments about how much people love it so I decided to make one and see if you’d like it in your home. I made it out of 100% cotton, including the padding inside but of course not the DELETE THIS buttons. 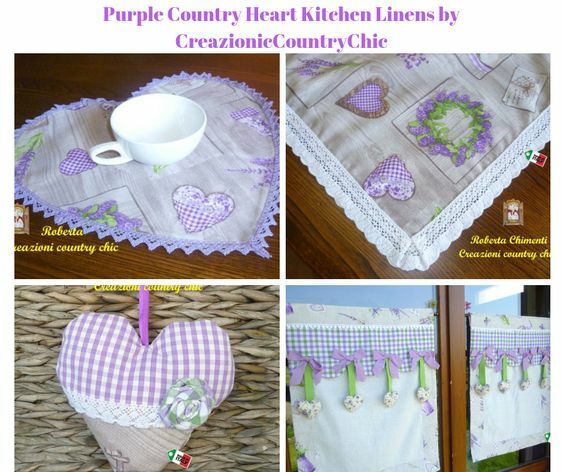 I chose fabrics that aren’t too over powering but work together giving a relaxed, country feel.